I am intrigued by flip-up helmets. I don't feel safe in anything but full face protection, but I'd love to be able to leave a helmet on and still talk to a cashier or another rider. However, there are some concerns -- maybe unfounded -- with the flip-up design. For one, the Snell Foundation will not certify helmets of this type. Because of this, many riders question the safety of a modular helmet. One can take some comfort in the fact that touring and "adventure" riders have used this design for years, and both of these groups are traditionally very safety-conscious. The AFX FX-28 Flip-Up Modular Helmet is an affordable example of the flip-up segment of the helmet market. The helmet has a relatively understated look to it (which I find refreshing). For cooling, it has a full compliment of intake and exhaust venting. A size XL weighs in at 1716 grams, which is rather heavy for a modern helmet. However, you must take into consideration that a modular design must have more hardware than a conventional full-face helmet. 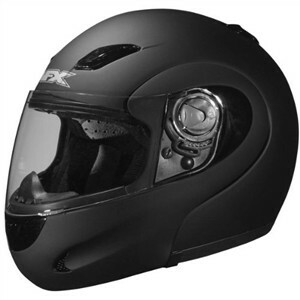 AFX has the confidence in this helmet to offer a lifetime warranty. It meets both DOT and ECE helmet safety standards. As far as colors go, the FX-28 is available in flat black, pearl white, blue, red, and silver graphics. It is also offered in solid colors -- gloss black, flat black, pearl white, and red. Sizes run from XS to XXL. Also take a look at the Shark Evoline modular helmet.